Imaginare Studios began with a question: Why aren’t women as represented as men in C-suites, boards, and STEM fields? Working together in an elective called Implementation of Ventures, Kali Bhandari, WG’18, Camila Noordeloos, WG’18, and Autumn Huiatt, WG’18, decided to use this question as the basis for their class project. Camila grew up in Brazil, where the Brazilian Academy of Science is comprised of only 14 percent women. 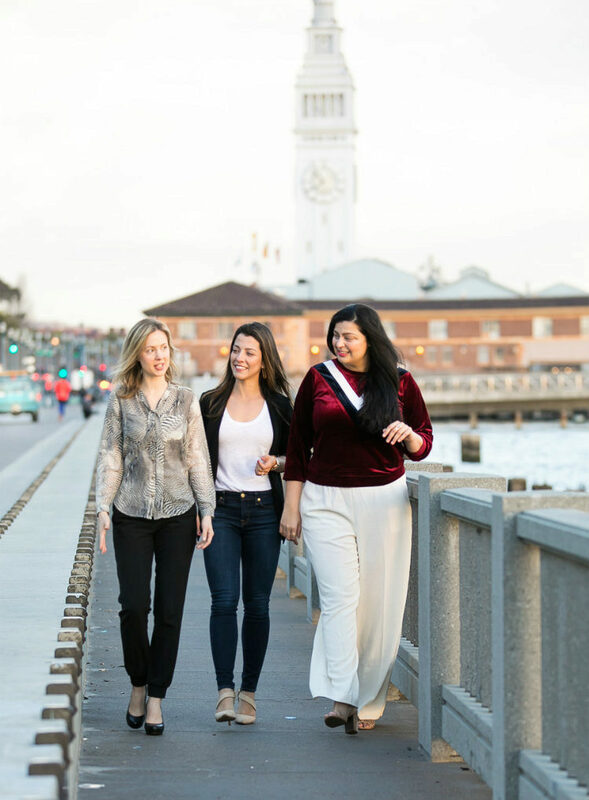 And Autumn, who grew up in the U.S., noted that women hold fewer than a quarter of senior executive titles in this country and less than 10 percent of venture-backed companies have a female founder in San Francisco. “We asked ourselves, ‘When do girls lose confidence and how can we change that?’” said Kali. In their class project, they began seeking feedback from potential customers and developing a pitch for a business targeted at gender confidence. They sent out surveys to classmates, friends, and family. “We were excited by the support we received, especially from women classmates and alumnae who wanted to make sure their daughters grow up with confidence. We had great feedback and advice on how to proceed,” said Camila. The next step was to come up with a name for their venture. Their first idea was to call it Imagine A Girl. However, in class they learned the importance of picking a name that would not limit the venture’s future vision. While they intended to start out with a focus on the gender confidence gap, they knew their interest could expand to other social issues. So, the name of the venture became Imaginare Studios. Moving forward, they started to develop a minimum viable product – a concept they learned in the course. “We wanted a way to test our idea quickly and cheaply to get customer feedback. We thought the best way to do that would be with a book,” said Camila. Using the Cinderella story as inspiration, Kali came up with a story concept where Cinderella solves her own problems – without a prince. After drafting the story, the classmates sent it out to their Wharton network to get feedback. “It was a huge challenge because we did everything from scratch, but we talked to other illustrators and authors as well as publishers to get tips,” said Camila. The Wharton network was extremely helpful in this process. They talked to a teaching assistant who worked in the publishing industry, an attorney classmate who walked them through the issues associated with revising a well-known story, a classmate’s friend who is a children’s author, and investors from Sand Hill Angels who were guest speakers in the elective. In the process of conducting research, Autumn connected with a Penn alumna who has written about raising confident daughters. They also talked with faculty in other departments at Penn, particularly experts in psychology and child development. As they took more electives in their second year, they applied what they learned to the startup. In Innovation, Change & Entrepreneurship, they learned how to avoid problems with cofounders and avoid common startup mistakes. In Strategic Brand Management, they learned how to define demographics and evaluate their brand, and in Venture Capital and Entrepreneurial Management, they learned about the legal and business formation aspects to forming a venture. Now, the alumnae have published their first book, Cinderella: Revised Classics for Modern Children, and are focusing on the core business. “We are growing awareness of the product, collecting feedback, and planning our next book,” said Camila, noting that future products may involve videos and other types of media. “This venture wouldn’t have been possible without Wharton. We met in the program, developed the idea in class, and took advantage of the resources and network, which were invaluable. We’re excited to take this venture to the next step and beyond,” said Autumn. Read about how Kali explored social impact at Wharton. Learn more about how Wharton’s EMBA Program has impacted Autumn’s career. Find out what Camila identified as the three benefits of taking a global modular course in Wharton’s EMBA program.